This walk is through some of the best native forest in the Bay of Islands. It takes you from Broadview Road, Opua down through a pretty valley to join the Paihia to Opua walkway. The forest here has never been milled or burned. A feature of the walk is the number of large, old native puriri trees to be seen (vitex lucens). 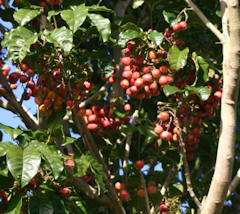 This tree can grow to about 20m in height and has a stout trunk and a spreading canopy of glossy green leaves. It is related to the teak and its very hard, dark red-brown timber was popular with early settlers for railway sleepers, fence posts, house piles and bridges. It is said to be New Zealand’s strongest wood and was so hard to split that timber workers often resorted to dynamite. Its timber can be spoiled by the puriri moth, a large green moth whose larvae drive holes into the growing wood. Its 2.5 cm deep pink flowers can be seen for most of the year (look for fallen flowers on the ground beneath the trees) and its large red fruit is favoured by native birds such as the wood pigeon and tui. Maori have used infusions of puriri leaves to bathe muscular aches and sprains and as a remedy for sore throats and ulcers.